What happens to all of the eggs that your chickens lay? Each week, we ask you to share your questions about farming, food or Sacrewell with us on Facebook. The person who writes the best question wins a free tractor ride for a child and accompanying adult, as well as having their question answered on our website. This question came from Jo Binge’s son Ross. There’s a lot of eggs laid at Sacrewell farm, with our flocks of hybrid hens and New Hampshire Reds in their outdoor enclosures as well as the Bantams and quails (which are not chickens but do lay eggs) who live in the Discovery Centre, so it’s no wonder that our visitors would like to know what happens to them. Our animal team collect the eggs on a daily basis and most of them are then taken to Reception where they are boxed up and labelled, ready for sale to our visitors. Depending on the time of year, we usually fill around a box and a half each day. The number of eggs varies as each individual hen can lay less when there are fewer daylight hours, when she is moulting or if she has been stressed by any changes in her environment. Occasionally, we decide to hatch some of our eggs. When this is the case, we place the eggs in our incubator which you can find in the Discovery Centre. The incubator keeps the eggs at the right temperature (37.5°C for chicken eggs) and keeps the air moist enough (around 50%) so that any fertile eggs should hatch in around 21 days. Our incubator can also roll the eggs, which replicates the way that the mother hen would naturally turn her eggs on a regular basis. If you are very lucky, you might see some chicks hatching in the incubator whilst visiting Sacrewell. 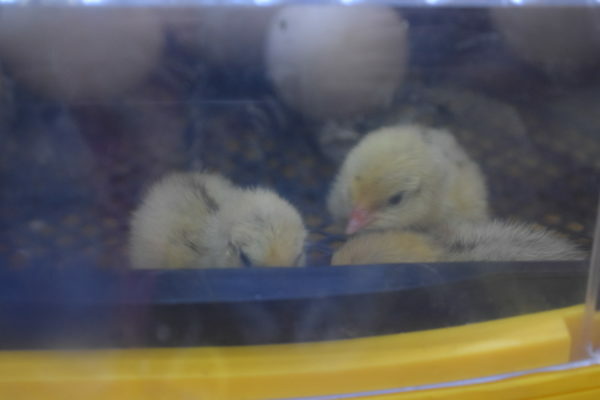 The chicks need to stay in the incubator until they are dry and fluffy, so although our team check on the eggs each morning and night, there’s no need for urgent action during the hatching process. The chick can actually survive up to 24 hours after hatching before it needs to have any food or water. There is one more way that the eggs are used at Sacrewell farm, which involves special groups like our Sacrewell Seedlings club. These lucky toddlers spent one session learning about the chickens, during which they collected eggs from the chicken enclosure and then watched them being fried before tasting them on some lovely floury baps. From field to fork (or in this case, fingers) in less than an hour and a half!